When u visit ur favorite hot-spot and u did not find anything new in season. U feel bore and tired. Same thing happened with us when we visited the little Rann of Kutch last Sunday. We saw GSE, Imperial eagle, Harriers, few warblers and routine water birds but nothing new. In addition, all of sudden we spotted one bird in flight mobbed by Harrier. First, we think its Long-legged Buzzard. When we saw it on desktop its look like Booted Eagle to us. 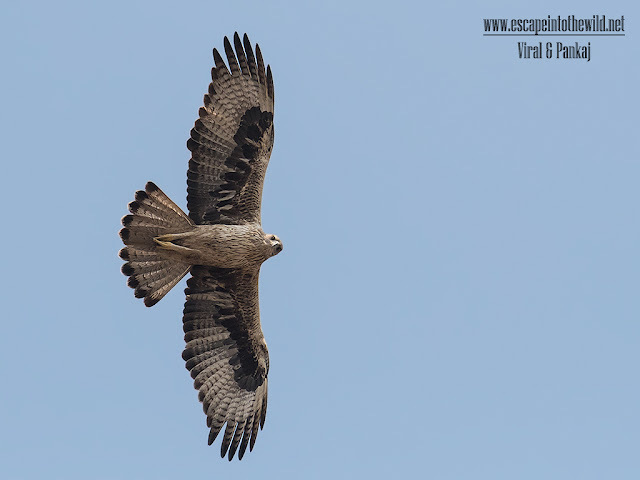 Then experts suggest its Bonelli's Eagle. One of the eagles, which we very much wanted to click. Suddenly boring trip turned into the interesting one! We felt lucky to capture this macho eagle in our LRK visit. The common name of the bird commemorates the Italian ornithologist and collector Franco Andrea Bonelli.